Larry Hedrick recounts Xenophon’s telling of the amazing accomplishments and leadership of Cyrus the Great, King of Persia. He created the largest empire in the history of the world up to that time and the leadership principles covered are applicable in any field, even today. Through real-life examples, Cyrus shows how to conduct meetings, become an expert negotiator, deal efficiently with allies, communicate by appealing to th self-interest of others, encourage the highest standards of performance, ensure that your organization has the benefit of specialists and prove that your words will be backed by your deeds. When Peter Drucker says it’s the best book on leadership, you better pay attention. 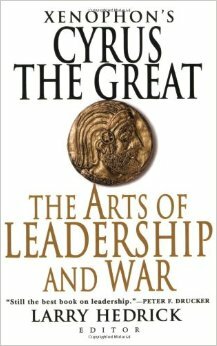 An extremely easy to read book that is just as relevant today as it was centuries ago and is applicable to any field that requires leadership. Must read. This entry was posted in Books and tagged Cyrus the Great, Larry Hedrick, Leadership, Management, Persia, War, Xenophon on March 31, 2015 by Blas.